Community involvement and charitable contributions have always been a part of the Voyles family commitment to the greater Atlanta area. Our organization has always been very involved with the community because we strongly believe in giving back and investing in our community. The Ed Voyles Automotive Group is proud to sponsor the Teacher of the Year Program for the Cobb County and Marietta City School Districts. Each year, the three (3) Teacher of the Year winners for the Cobb County School District as well as the winner from the Marietta City School District is given a free car to drive for a year. Should any of those four recipients win at the State level, they are given the car permanently. In addition, we offer free oil changes and discounted parts and service work to all Cobb County school district employees and their families. We are annual partners in the major fundraising efforts of the United Way, the March of Dimes, the American Red Cross and MUST Ministries. Additionally, we provide annual support to the American Cancer Society, the American Diabetes Association and the Alzheimer’s Association. We offer matching contributions to monies raised by an employee for any charitable organization he or she supports. Most recently, we were the major sponsor in the fundraising efforts at Ashford Park Elementary for their Outdoor Classroom and the Montgomery Elementary School STEM Program. The Voyles children – Valery, Ben and Bill – are all very involved in various charities and are Board members of many worthy organizations including The Shepherd Center, Cumberland Academy, the Cobb Energy Performing Art Centre and the March of Dimes. In addition to donating their personal time and efforts to those causes, they personally support their fundraising efforts. In addition to their personal sponsorships, the Ed Voyles Automotive Group supports those fundraising efforts as well. See below for recent events the Ed Voyles group has been involved in. Ed Voyles is proud to have donated over $50,000 to Chamblee Middle School. 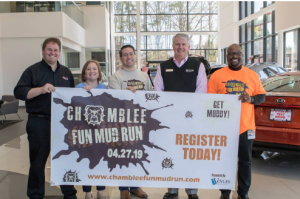 This year, we were an active sponsor of the 2019 Chamblee Fun Mud Run! We are proud to be a Birdie level sponsor of this April’s Cobb Schools Foundation Golf Tournament! The Ed Voyles team will be at the event to support Cobb education and development. Join us April 15th at the Indian Hills Country Club!